Well look at that, it's time for our weekly chat once again. I missed you all last week! This week I talk generally about busy life happenings (the recent audio projects, end-of-the-semester teaching adventures) as well as how my family Advent observance is going. Care to catch up with me? Let's do this! My appearance on Allison's Gingras's show A Seeking Heart. We talked about blogging, parenting, dancing, all sorts of fun stuff. My big day on the CM Hangout podcast. Our topic was family Advent activities and wellness for busy moms. The St. Andrew Christmas novena. You can still procure the Magnificat Advent Companion, in Kindle form, for $2.99. 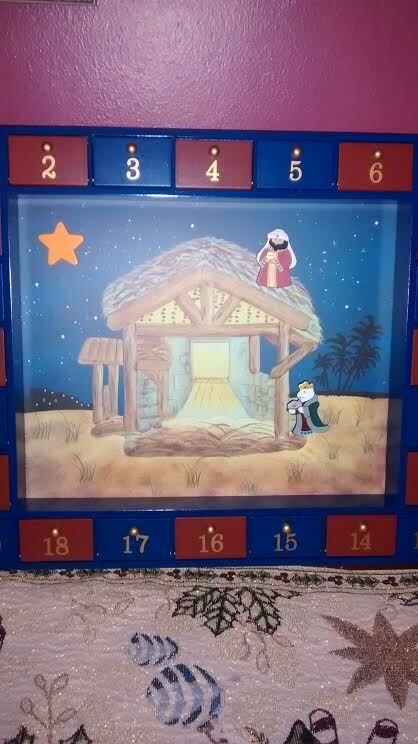 Relatedly, this is our family Advent calendar, day 3. Can you guess who put up 2 of the magnets, and who put up the latest one? December is always crazy because all of my projects/papers for my education courses are due in the last few weeks, and then there is the studying for the exams in my other courses. Christmas break will be much needed in two and a half weeks! I am also using the Magnificat Advent Companion for the first time! Our parish always hands them out after Mass on the first Sunday of Advent, so I brought one to school with me. I am enjoying it! If we could have candles on campus, I would also have an Advent wreath, but I'll have to settle for paper flames for now. Hi Samantha! Yes, I'm glad that I'm not alone in my college student observations. ;-) It was the same when I was in college too! I remember how stressful those last few weeks get. I have to admit, I don't miss that! The holiday respite after that is SO very needed, yes indeed. Your comments about involving yourself with parish life made me smile and grimace at the same time. In a couple tangential experiences I have had, there always seems to be an "old guard" (this is not necessarily an age-related designation), who, owing to the fact that they have been on a given committee longer than others, feel the need to guide the newbies. Granted, there are times when this is helpful. There are other times when it becomes impossible to come up with new, kind (and therefore oblique) ways to say, "With all due respect, I have heard and understand all of your explaining, and I just do not agree - although the final outcome of this matter isn't really all that important." Said directly, there is no way the person with whom I am conversing reacts positively, no matter how much I smile, sometimes/often/always spilling over into larger parish social interactions. (That's OK, I can ask Joe Flarp, Jr. to serve me a donut, no need to trouble yourself! *Smiling*) This, over things like whether the seasonal prayers are printed as a bi-fold that fits into the front flap of the hymnal or are printed as a single page and distributed/collected by the greeters/ushers. This kind of thing alone causes me to pray specifically for whomever is my parish priest. It also causes me to keep my head down now. I'll help with the seasonal parish cleaning. My brothers refer to people of that type as "grumpy bears." So, best of luck with your grumpy bears! My advent has been okay. I was out of town for Thanksgiving so I still haven't found my Advent wreath or Jesse tree from storage but I'll get there eventually. My churches Religious Education program is doing a christmas pageant in two weeks and I am going to be playing the piano for the songs which is exciting. I took lessons for years but once I was out of school it was hard to find time to play. But it's crazy how easy it was to just pick it back up. Now I'm kind of excited about it and found a bunch of apps and programs to practice with. Hi Beth Anne! Oh my goodness, I'm so excited for you & your piano project! That's such a good feeling, isn't it? To re-remember & rw-capture why you love something so much?